When our travel agent friend, Donna asked if we’d be interested in a wine-themed cruise on France’s Rhone River, we said, “Are you kidding? Sign us up.” And so, here we are about to embark on our first European river cruise, something that’s been on our short list since we hired a self-drive barge in Burgundy 30 years ago. We do seem to favor renowned wine regions, and that’s not just chance. 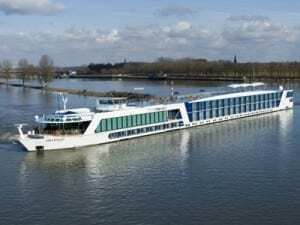 AmaWaterways, a 12-year-old company specializing in river cruises, offered a beautiful 150 passenger vessel, AmaDagio, and a program that includes winery tours and tastings, on-board tastings, wine and food pairings, and informative lectures, along with an on-board wine host. We’re looking forward to meeting our host, Steve Ledson, owner and winemaker, Ledson Winery & Vineyards, in Sonoma, about an hour from our California home. 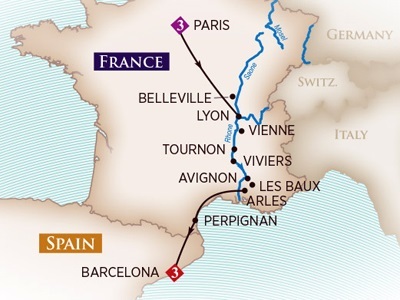 Chateauneuf-du-Pape, Cotes-du-Rhone, Hermitage, and Beaujolais are among the appellations we are excited to visit on this voyage. We are also looking forward to spending time in Arles, our port of embarkation, and Lyon, where we will disembark, both cities we have previously visited and thoroughly enjoyed. Though the cruise line offered pre- and post-cruise extensions in Barcelona and Paris, respectively, we opted to visit these two incredible destinations on our own. We want to spend some extra time in Barcelona, as this will be our first visit there, as well as in Lyon and Paris where it seems we always want to linger. We’ll see how the late Fall weather turns out—we’ve only visited Europe in Spring, Summer and early Fall—but we expect some rain and cool temperatures. We’ll report regularly regarding our experiences aboard AmaDagio, and our intriguing shore excursions—included in the package price, as is the wine. We’ll also report from Barcelona and Paris. Even though not part of the cruise, these destinations will be visited by many of our fellow passengers. So, stick with us for the next three weeks, and we’ll share our journey for your vicarious pleasure as well as offering information that might inspire and inform your next trip.